Willa was a Category 5 Hurricane before it weakened in strength and made landfall at Category 3 almost exactly half way to Mazatlán from here. We had rain all evening and night on Tuesday, October 23, but very little wind. 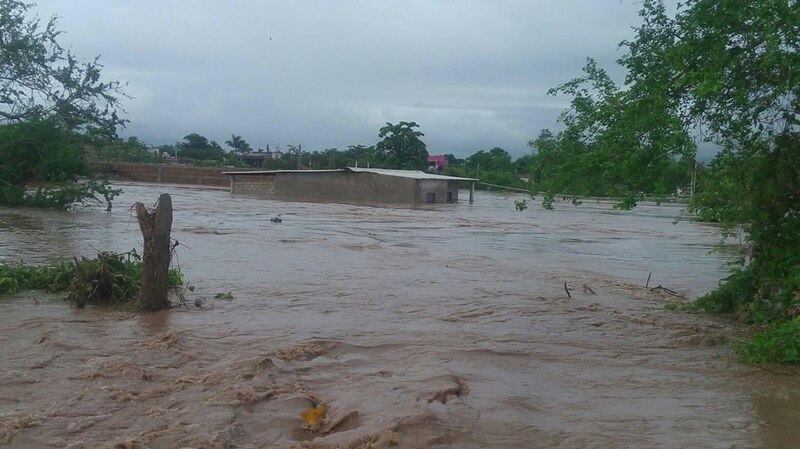 As the storm continued inland through southern Sinaloa and into Durango, the rain that it dumped caused rivers from the mountains to rise. 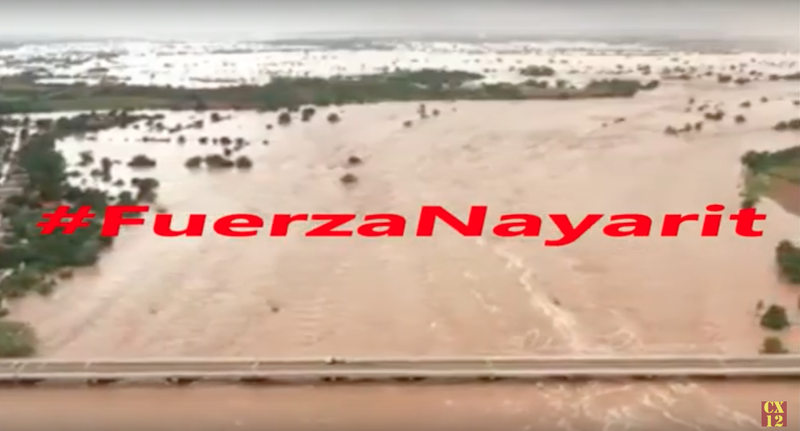 One of those rivers was El Rio San Pedro which winds down from the State of Durango and curls behind us before it crosses the interstate in Peñas and on into Tuxpan. 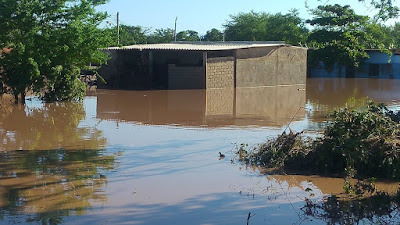 Water rises during the rainy season, but nothing like it did the next day, Wednesday. Picture of Tuxpan taken from the internet. Usually there is no water except for the river that runs between two rows of trees at the bottom of the screen. Rebecka's High School is the uniformed buildings at the center-right with a field in the back of them. Pastor Abimael was with us in Mexico City and his wife, Martha, stayed behind with her brother while she was to have some dental work done. We dropped him off at his home on Tuesday morning at 6am in Tuxpan. 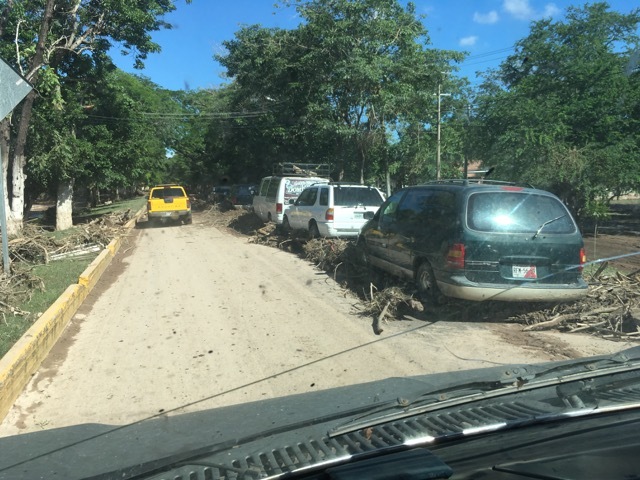 After dropping everyone else off in Cofradia, we rested a couple hours before getting things ready for the storm that was to hit later that afternoon. We had rain all evening and through the night with a little wind, but everything was calm the next morning. At noon, I went to my office and found that there was no internet, no cell coverage, and realized that our phone service was out. I connected to our satellite internet to get a few things done and opened Facebook. 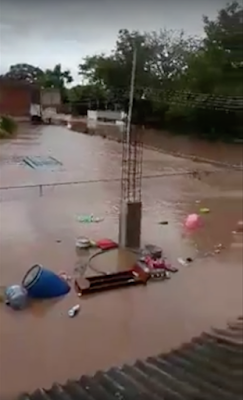 Just after 1pm I saw a video someone uploaded about Tuxpan beginning to flood. I then saw another video of our friend Pastor Vladimir on top of his roof, showing how deep the water was, his family's two trucks were both under water and you could barely see the roof of his van. Screen shot of the video Pastor Vladimir showed from his rooftop as the water was rising. You can see the top of his green van, the top of the his property fence along the street, and his wooden pulpit floating on it's back. By then I was a little concerned for the people, but continued on with my day and went to our bible study at the church. 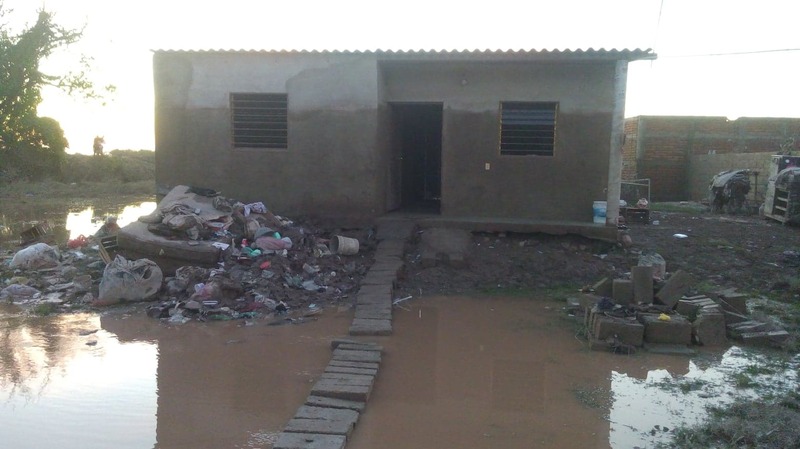 We ended up staying with Pastor Abimael all afternoon until dark helping him clean his house. His house is one of our Dwellings houses; built on a mound of dirt about three feet high. The water was still up to the doorway and came up to our waist as we walked to the house from the road. After nearly twenty minutes of trying to pry our way in, we saw that had a huge mess to clean. We tossed their sofa, china hutch, dressers, books, cds, shoes, computer, printer, etc. into the water. It was sad to watch them as they watched their stuff float away. 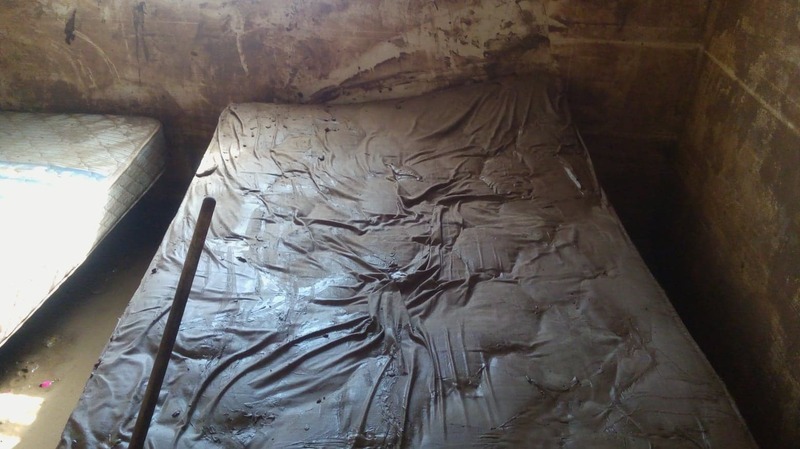 Everything was full of mud: the stove, washer, tools, welders, air compressor, dishes, clothes, etc. The water had risen above the windows at it's highest point. Pastor Abimael took this picture of his house Wednesday afternoon while he was standing on the border-dam that protects the town as the water was rising. Saturday, Geña and I took Rebecka to visit one of her friends who lives in town. Most of Rebecka's classmates are from Tuxpan. We were able to find the house where she lives with her grandmother and brother. They were still cleaning and removing mud from the house, but had a lot of work to do. I had Doctor's orders to not return to Tuxpan due to a toe infection I got on Thursday. We stayed and visited, gave them food, pillows, and some blankets. 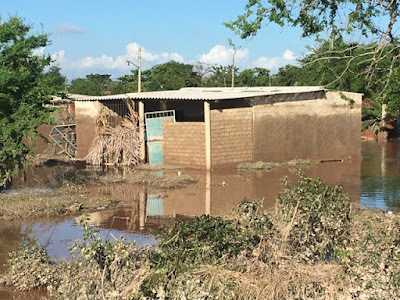 We returned to Pastor Abimael's house a few days ago with the team that was here from Utah, which is the same team and many of the same people that came to build his house. That is when he shared his experience with us. They live at the edge of town. 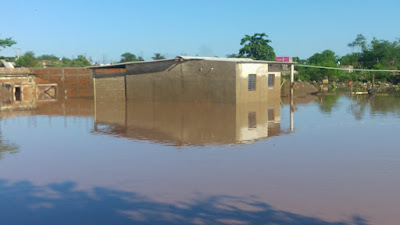 There is a border-dam with a road on it that blocks flood waters from coming in to the residential area which is where Pastor Abimael was standing when he took the above picture. The river began to rise to the point that it started to come over that road. That morning, he was able to take his Mom and daughter to another town where his other daughter lives. When he returned, he took his motorcycle out of the house, put it in his truck and parked them on the border-dam road. As he was returning back to the house to shut the door, he had to swim because by then, the esplanade downtown had broken and water was coming in from the opposite side now, too. Pastor Abimael could not return to his truck. There were three currents surrounding his house and were too strong as they saw it sweep away two horses that were trying to cross. He and two others stood on the road from 2pm on Wednesday until 5am Thursday morning next to a bush with the cold mountain water rising above his knees. All night long with no sleep. He said for the first time in his 47 years of life that he told the Lord, "Here's my life"; he thought he was going to die. Thank you to so many who had been praying for all of us and for those in this region. It was the Lord that kept Abimael safe that night. 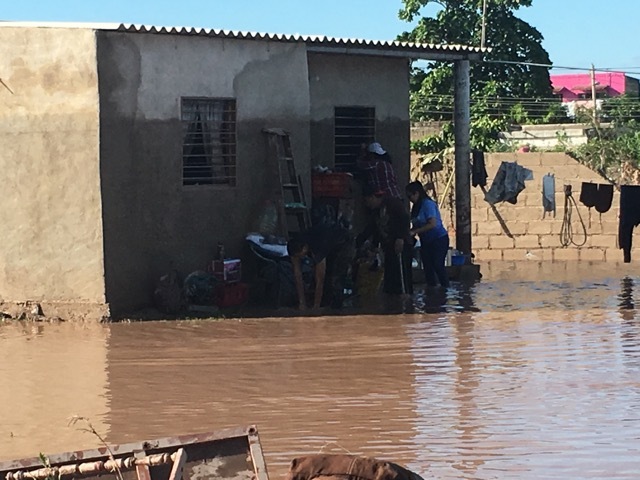 While we were in Mexico City the weekend before the storm, his wife had a dream Friday night, four days before the flooding, but she did not say anything. 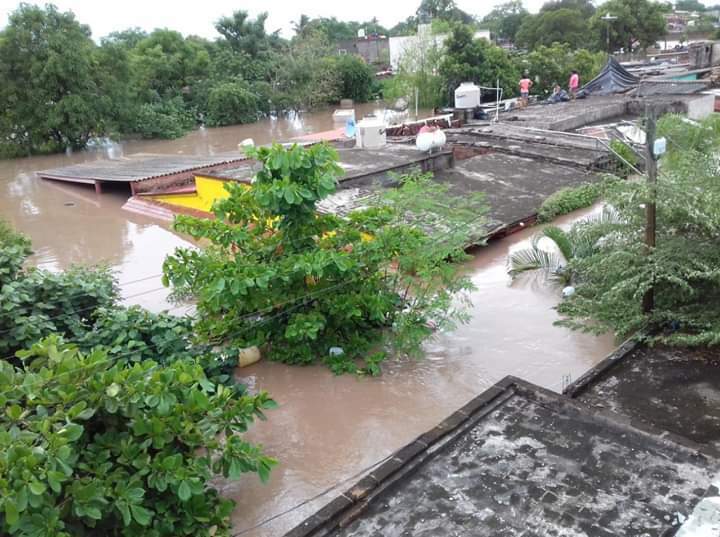 In her dream, Tuxpan flooded. Everything that happened came true except one thing and we believe it is because of your prayers. What she didn't say until later was that in her dream, Abimael had drowned. Praise the Lord he didn't. 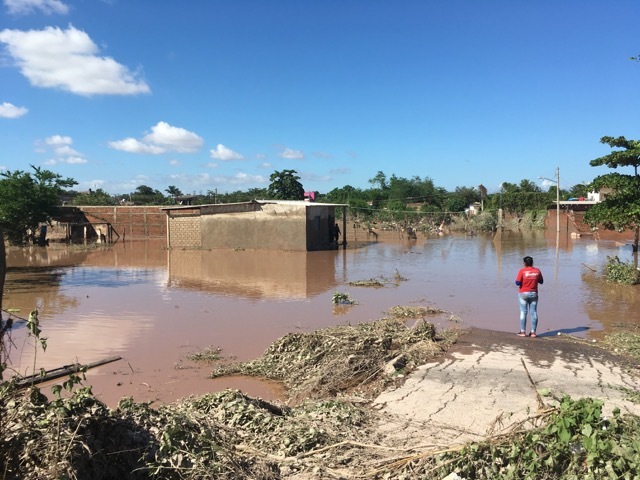 This could have been a lot worse and we praise the Lord for having mercy on Tuxpan. This happened in the middle of the day. If it would have happened during the night while people were asleep, it would have been a complete tragedy! The last time I heard, they had counted nearly 30 deaths, three of which was of a young family who had been trapped inside their house with their child and drowned. They were found inside a couple days later. 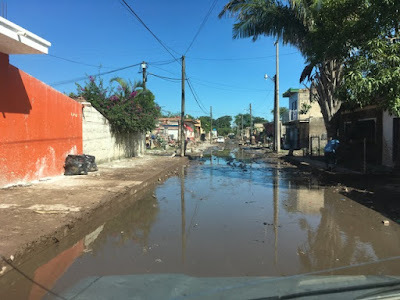 This is what whole neighborhoods looked like in Tuxpan. Please continue to pray with us for the emotional state of the people and that sickness would be at the bare minimum. Many, many animals drowned and the stench began to quickly fill the air. They have since buried all of the animals in one spot, but in some areas, there is still the smell from all of the garbage. 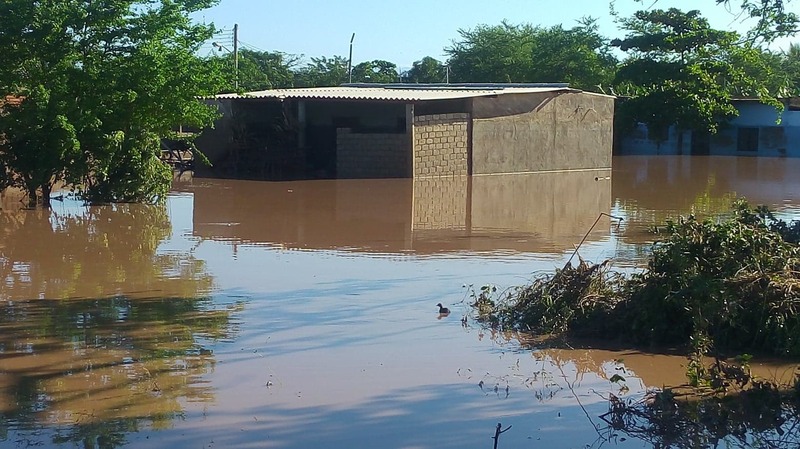 We have set up a donation link titled "Cofradia Disaster Relief". There has been help from many local people, but there are things that will take a lot of time and money to replace. You can help. 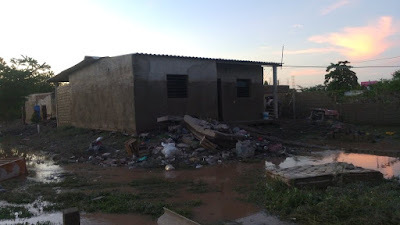 Pastor Abimael and his family need new closets, tables, chairs, mattresses, nice clothes, washer, stove, computer, printer, study books, tools, kitchen appliances, and more. They need a completely new sound system for their church, new instruments, a projector, and bibles. Everything was under water, covered in mud, and ruined. This is the same story for just about everyone on the east end of Tuxpan. In addition to those material needs, Pastor Abimael's house needs to be repaired. The whole back end broke off and sank about 6 inches. Please consider how you can help. This was the sight we saw as we arrived the next day. The water was three feet deep to get to the house. The back of the house. 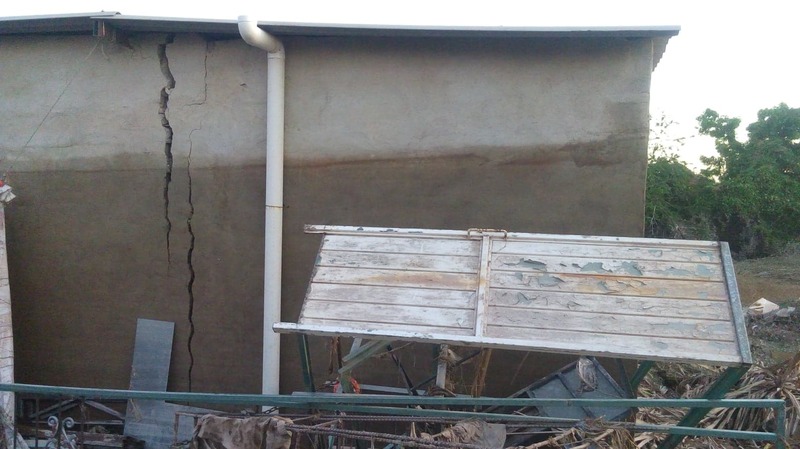 As the water continued to recede, the back porch and wall continued to sink. Nearing the end of the day after cleaning what we could. The back side of the house showing where it broke off. This mattress shows what most of their stuff looked like. 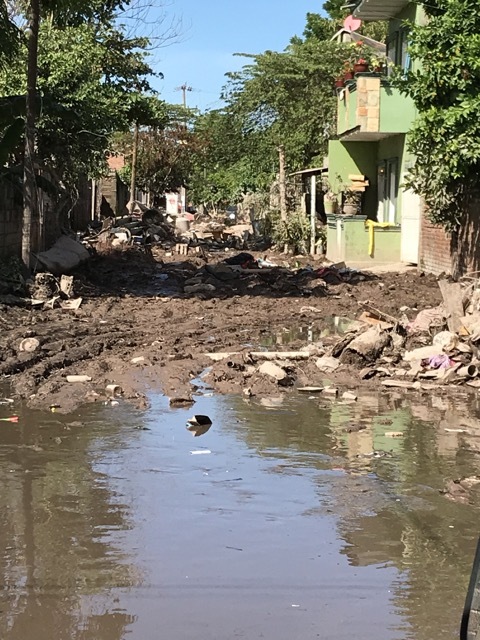 Two weeks later, some streets were still in dire need of help. 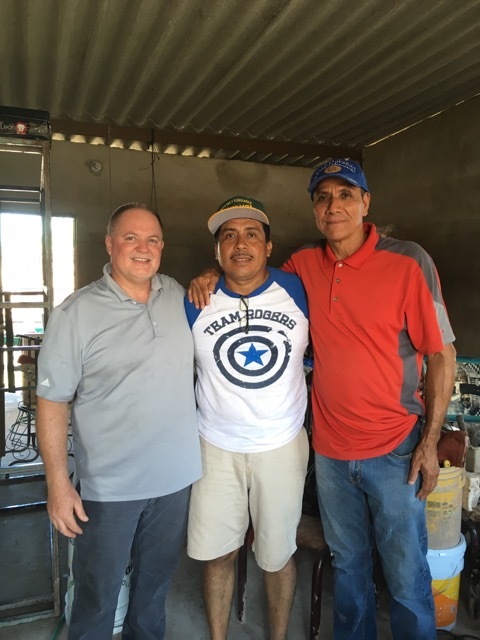 We took some food and clothes that were donated by some people in Tepic and dropped off some bibles for Pastor Abimael's congregation. Thanks again for your prayers and help. 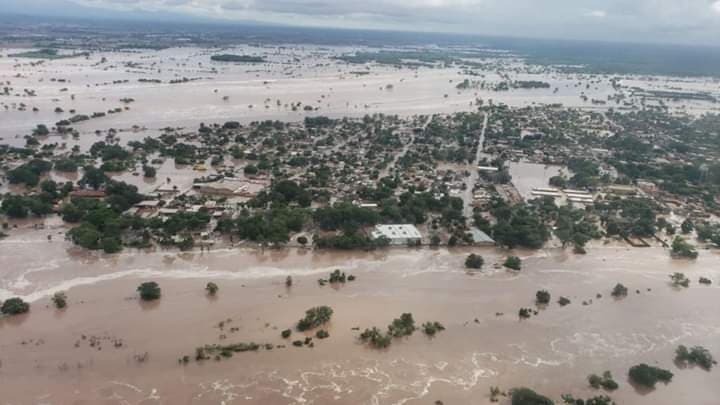 We will continue to do what we can to help our friends and spiritual family in Tuxpan recover from this unfortunate event. God is good...all the time! 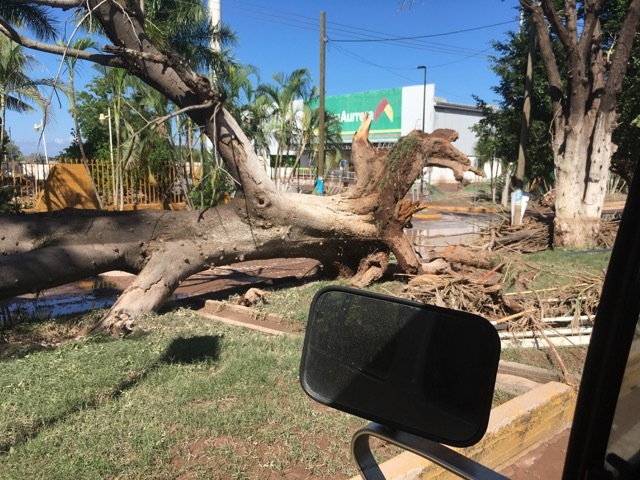 Let's help restore Tuxpan together.